The 8x8 HDMI 2.0 Matrix Switcher with Output 4K2K Scaling from Link Bridge supports video resolutions up to 3840 x 2160 at 60 Hz and 4096 x 2160 at 60 Hz with 4:4:4 YUV and HDR formats. It features multiple control interfaces including front-panel buttons, RS-232, Telnet, WebGUI, and IR remote. This matrix switcher supports pass-through of audio formats including LPCM 2.0-7.1, Dolby Digital, DTS, Dolby Digital Plus, Dolby TrueHD, Dolby Atmos, and DTS-HD Master Audio. 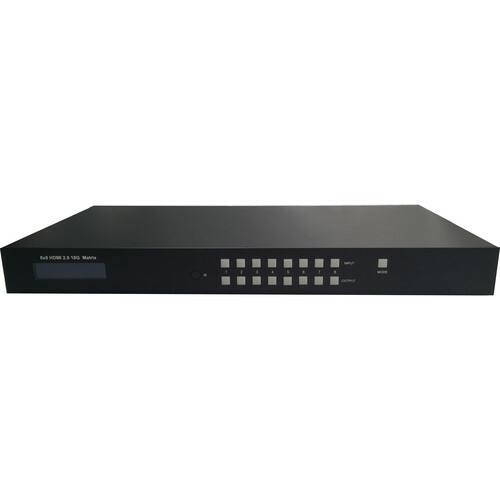 It is HDCP 2.2 compliant and supports EDID management.